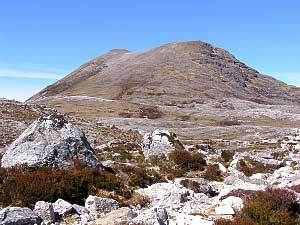 Beinn Eighe National Nature Reserve is one of the most important areas in Scotland set aside for nature. Beinn Eighe is the Uk’s oldest National Nature Reserve (established in 1951), and also one of the largest with almost 48 square kilometres. 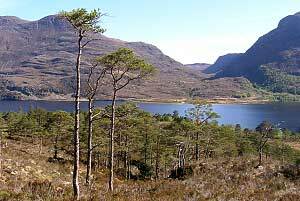 The reserve stretches from the loch-side of Loch Maree to mountain top, and was set up to protect the largest remnant of ancient Scots pinewood in the western Highlands. The woodland is known in Gaelic as Coille na Glas Leitor, or “Wood of the Grey Slope”, and covers the lower hills on the south bankof Loch Maree. 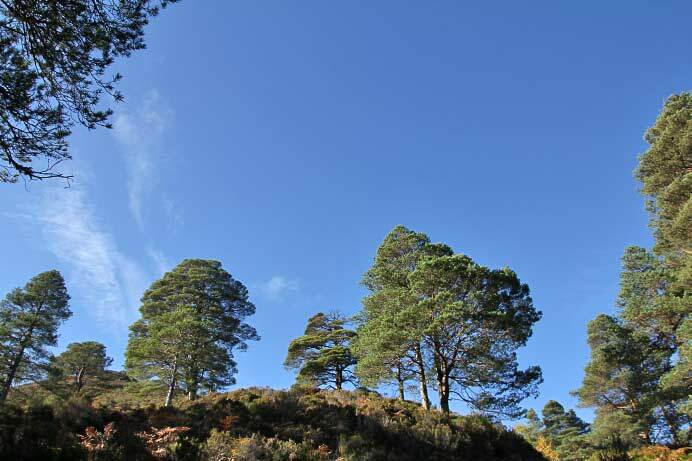 Scottish Natural Heritage is encouraging this living link with the original forest of the Highlands to spread naturally across the reserve, as well as planting native trees in areas where people long ago removed the woodland. The removal of woodland occured on several occasions. During the 17th century iron smelters flourished along the northern shore of Loch Maree. Huge quantities of local timber, mostly oak, but also pine from the woods around Loch Maree, fed this thriving industry. The iron created cannons, the killing machines of their day. In more recent times, only 60 years ago, lumberjacks felled large areas of this beautiful woodland. Many of the mighty pines came to an end when they were logged and planked for use in Second World War ammunition boxes. To enjoy this fabulous nature reserve there are two trails available, one on the lower slopes in the woodland and one higher up. 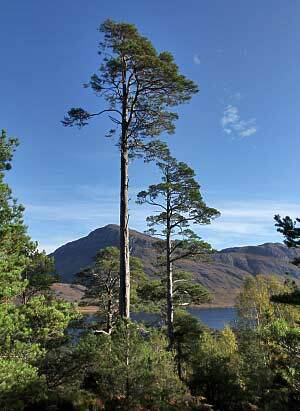 To properly disover the beauty of the Scots Pines I can recommend the scenic trail above Loch Maree. The Beinn Eighe Woodland Trail takes you into one of the few remaining fragments of the original forest that once covered northern Scotland. 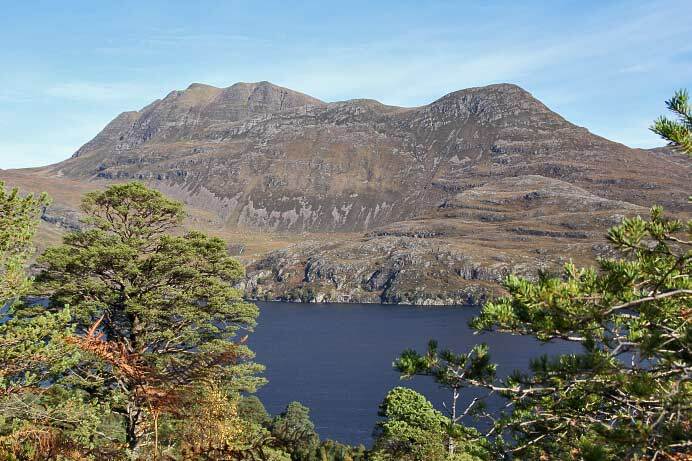 This is a very relaxing and rewarding walk through native woodland and leads to a viewpoint overlooking Loch Maree and the majestic mountain of Slioch beyond. The trail itself is 1.5km long (1 mile) and takes about one hour to complete. The trail is easy to follow, although steep in parts. Strong walking shoes are recommended. This is a fabulous trail to explore the hills of Beinn Eighe and this trail is the only waymarked mountain trail in Britain. This loop trail takes you up through ancient woodland, rugged grasslands and heath, to the beautiful heights of the mountain terraces. This is a memorable walk, with breathtaking views over the surrounding mountain landscape. The 6.5km (4 mile) walk rises to 550 metres and takes three to four hours to complete. The path is steep and very rough in places, so it can be challenging for less experienced walkers. You will need to wear hillwaking boots and take food and warm waterproof clothing, as the weather can change quickly and the top of the trail is very exposed. On the A832, just before Kinlochewe, is the Beinn Eighe Visitor Centre. The visitor centre is open from April to October and can be contacted by Tel: 01445 760254.